Paillettes, or little round discs of real silver or gold, have been ornamenting clothing and fabric for centuries. You see them on costumes and gowns in museums, on haute couture garments today, and probably in the needlework projects of your stitcher friends. 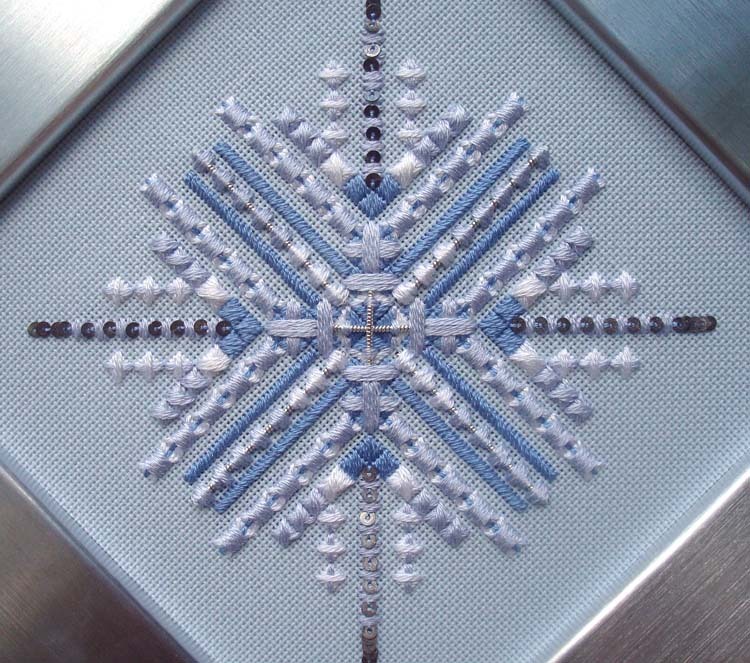 They are often used in silk-and-metal needlepoint projects and counted thread designs. Just Cross Stitch magazine is currently featuring them in their 30th Anniversary sampler project. As a real-metal decoration, paillettes add a level of elegance to a design, plus unique texture, a little shimmer to catch the light, and "something different" to capture attention. 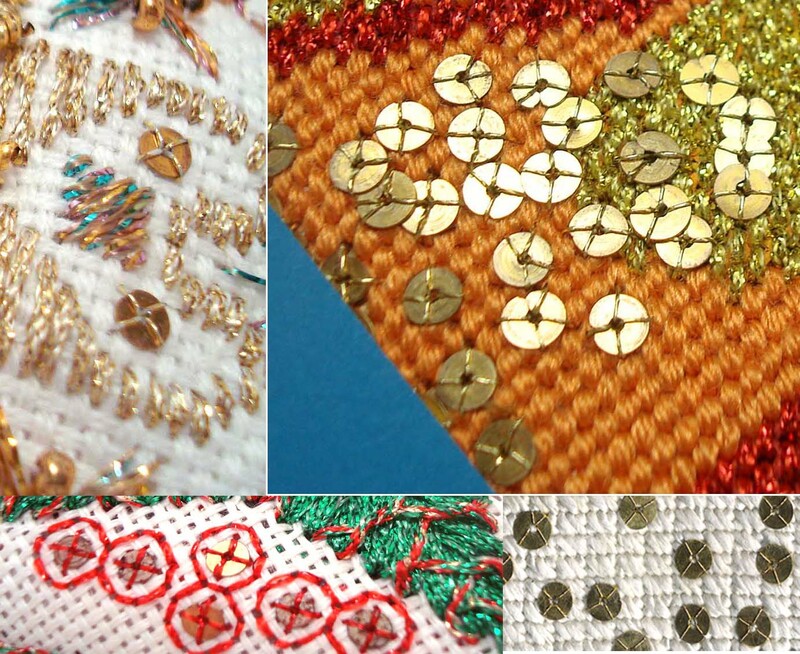 As needleworkers and creative people, we love details, and paillettes are about as uniquely-detailed as you can get. Paillettes are surface embroidery embellishments, sewn onto a design using just about any thread, but the most common is silk thread. Attach one by bringing your needle up through the fabric next to the paillette (note: select a needle that will pass easily through the hole), then down through the center hole. Usually three stitches in a "Y" formation are enough to keep the paillette in place. You can top off a paillette with a bead for added dimension, or make a decorative stitch over the spangle. Apply them in clusters or singly as needed to achieve a desired effect in a design. They make beautiful embellishments for borders and backgrounds. You can even use them to replicate "realistic" texture such as fish scales. Kreinik's paillettes are ecclesiastical grade, which means the real metals have been processed with an additional tarnish-proof coating which extends the length of time it will remain bright. If used on a garment, go to a dry cleaner with experience in treating heirloom clothing or costumes. 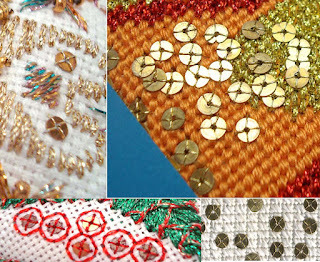 Take a look at the photos here for inspiration on where you can use paillettes in your next project. Whether you are making a wedding dress, embellishing costumes for your local theatre group, creating jewelry, or doing needlepoint, cross stitch, counted thread, stumpwork, surface embroidery, or Brazilian embroidery, you can use these real-metal decorations just as our needlework-ancestors did: to add the most elegant spangle you've ever seen. "Does color 421 come in Very Fine #4 Braid?" "What shade is 2829 Seafoam?" These questions and more answered! 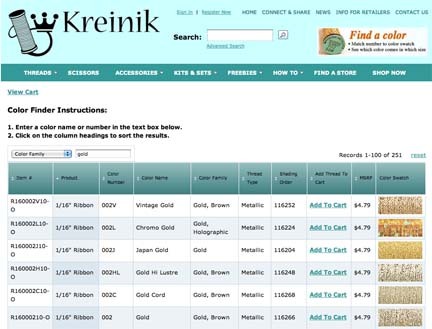 The newly redesigned Kreinik website features one of the best and most useful tools for stitchers on the internet*: a Kreinik Metallic Thread Color Finder. Put a Kreinik color number in the text box and within one second you see the color swatch and know which thread sizes are available in that specific shade. 1. Enter a color number in the text box, such as 421, 002 or 102. Search by "All Columns" for the broadest search or click on the blue arrow box to select a search by "Color Number." a. You will see all of the thread sizes available in that color. 2. You can also enter a color name, such as Silver. 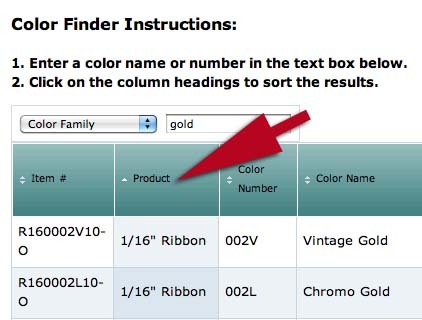 Search by "All Columns" or click on the blue arrow box to select a search by "Color Name." 3. You can also search by color family, which is a more generic search. For example, you can search for all of the red colors, or all of the metallic colors that contain black. a. You will see all of the Kreinik colors containing that particular hue. b. Since this list will include many pages of options, you may want to organize the list by Product (thread size/weight). For instance, if you want to know all of the gold shades available in Tapestry #12 Braid, search All Columns or Color Family for "gold" (in the text box), then click on the green header "Product." Scroll through the pages to see the Tapestry #12 Braid selection. ITEM NUMBER: The Kreinik SKU number. PRODUCT: The thread size/weight. Only Kreinik metallic threads are in the database. COLOR NUMBER: This is the color number found on the spool label, on needlework charts, and in patterns. COLOR NAME: The official Kreinik name for each color. COLOR FAMILY: Indicates the base hue. SHADING ORDER: The numbers were really designed to be an internal reference system, but they also indicate a color's spot in a particular shade group. ADD THREAD TO CART: You can buy directly from this Color Finder chart. MSRP: The suggested retail price. COLOR SWATCH: Digital scan of an actual spool or swatch of thread. 1. Click "Reload Page" on your web browser to see if that fixes the problem. 2. Click "reset" on the right side of the Color Finder. 3. Or email us (info@kreinik.com) to report a problem. 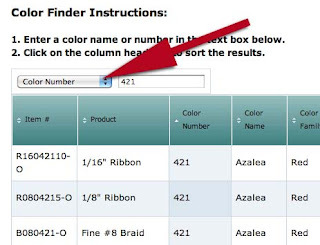 Bookmark the Kreinik Color Finder page for quick access on your computer, laptop, tablet, or phone: http://www.kreinik.com/color_selector/ The search for Kreinik colors just got easier!